But it is unforgettable even down the years. The symphony of kundus[ii] of all sizes. Wahgi warriors wear a type of woven “skirt” and headdress. Pearl shell necklaces show wealth having been traded with coastal tribes. © P Cass 1972. Watabung women -beads from Job’s tears. Fences are trampled as the crowds disperse. At a Maori welcome in Rotorua. The firepot men at Goroka Show. P Cass 1972. Re-enacting the labour line bringing the kiap to a village. © P Cass 1972. [i] A bunch of leaves stuck into a type of belt which covers a man’s backside (or front). G requires grit to get to the end! Some places are larger than life and offer experiences beyond your imagination. Goroka, headquarters of the Eastern Highlands District/Province of Papua New Guinea (PNG) is one such place. We lived there for a few years in the 1970s arriving from the tiny town of Alotau and being bedazzled by the shops and variety on offer. 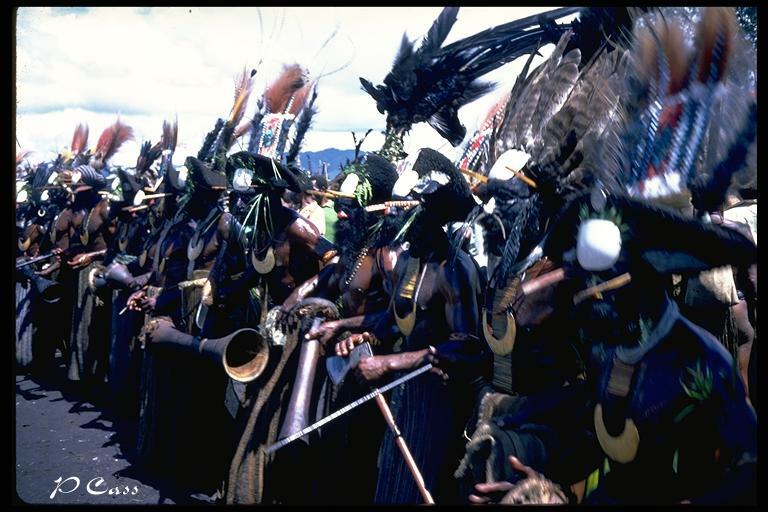 Before you get the wrong idea, Goroka was not a thriving urban metropolis with glittering shops…not at all, it was just that we’d become accustomed to shopping by post/catalogue, ordering food in by trawler, or shopping at one of the four trade stores in Alotau. 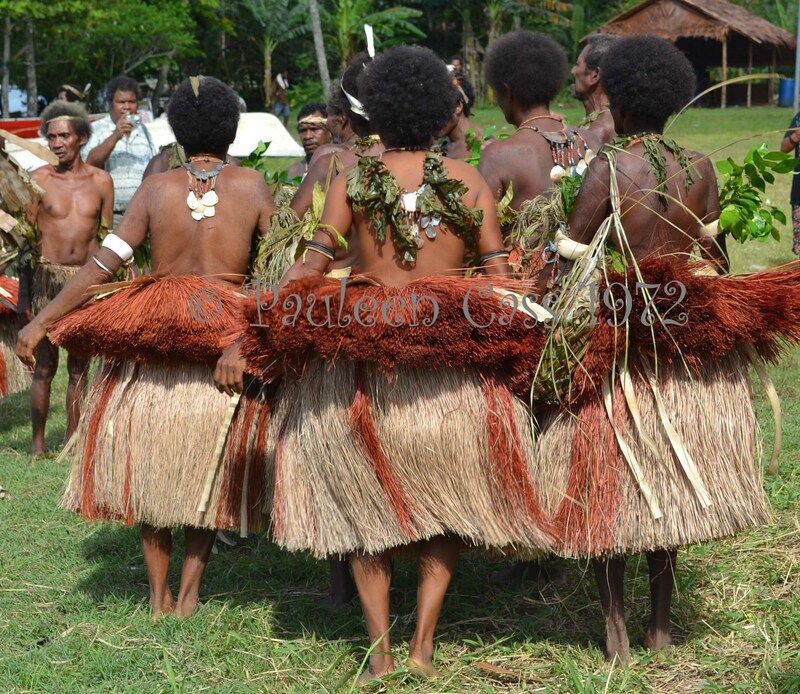 Nothing about Goroka was mundane or familiar to anyone who grew up elsewhere (which included me, but not my husband). 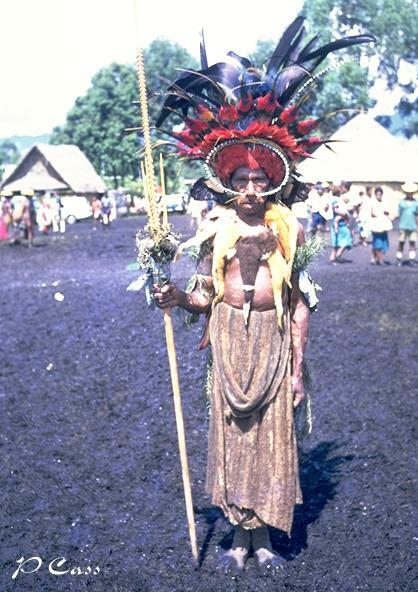 When you live in PNG, you become accustomed to people wandering around almost naked: warriors in beads and loin cloths, women in beads and slightly larger loin cloths and almost always a child at the breast, men and women shiny with pig grease to keep the cold out, and smelling of smoke from living in a hut with only a tiny gap in the roof for ventilation. We had a village at the back of our government-issued house and a squatter settlement down the end of the street…anything left under the house had a habit of going walkabout. Yet strangely our vegetable patch survived untouched. 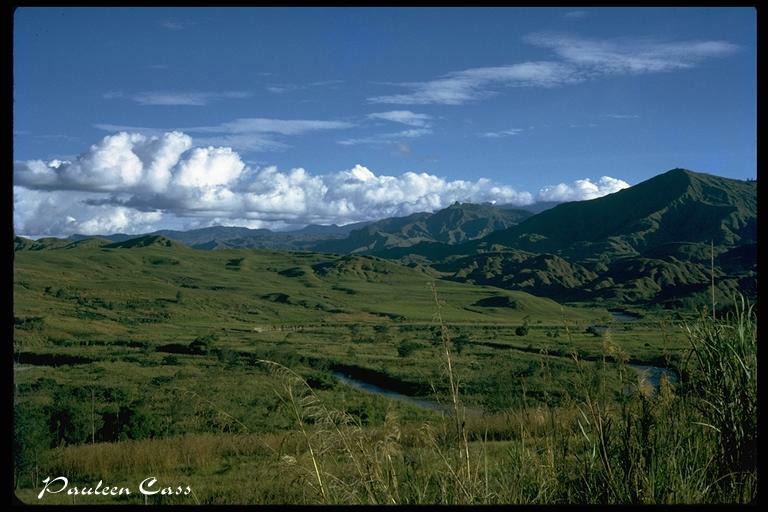 Goroka is at 1600 metres (about 5200 ft) and sits among high mountains. It has a fantastic climate: about 21C daily all year, and cool enough for blankets at night. Heaven! The local Seventh Day Adventist Mission at nearby Kabiufa grew fresh vegetables and flowers and we’d drive there each Sunday after Mass to buy up for the week. Until then I’d never eaten broccoli or cauliflower, for example, and these were miniature versions, so cute. We had a great system going where we sent fresh vegetables in an esky to my in-laws on the coast, and they sent us fresh crayfish tails in return. I can’t tell you how much our friends loved us when the flight came in, and how much we all enjoyed the delicious crayfish curry. 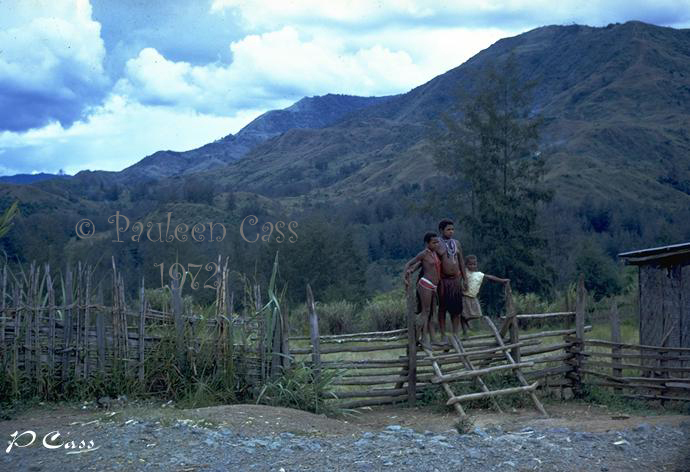 Highlands scenery around Goroka © P Cass 1973. Goroka was accessible by road to other places via the Highlands Highway which was an adventure in itself. We drove to Lae one year with my parents, something of a challenge to our little Datsun 1200. We took day trips up to Daulo Pass or down to Lufa for a picnic: something that always drew a crowd in the Highlands..no chance of going anywhere without someone watching you. 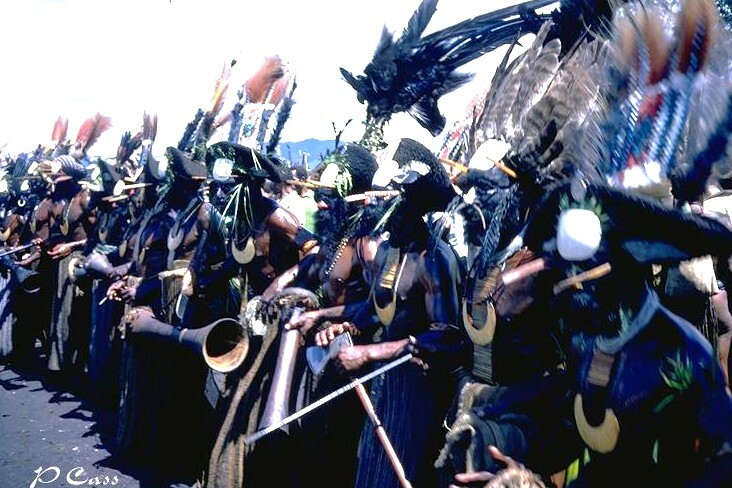 On one return drive to Daulo, we came around a corner with a small cluster of warriors running towards us, spears in hand, and “singing”, plainly intent on some stoush or other. We locked the car doors, made no eye contact and kept our fingers crossed. Mercifully they had other issues to deal with and were not interested in us. Payback is huge in PNG, over the loss of a pig, issues with women, perceived slights etc. Best not to be around when that happens! 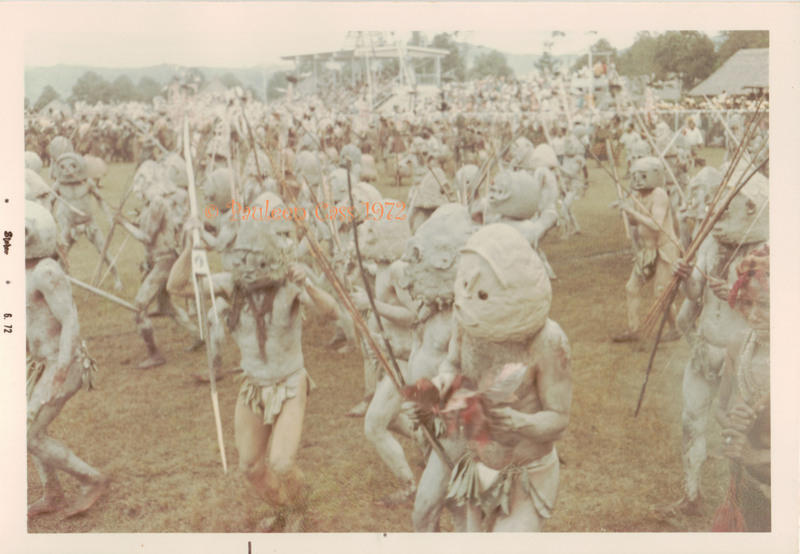 And then there was the Goroka Show! Imagine thousands of warriors in one large football area all dressed in their specific dress-styles, armed with arrows, spears etc, all coming together in peace for a massive singsing (singing and dancing). 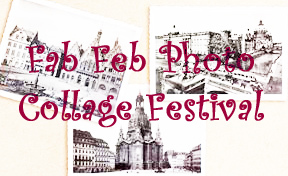 Truly if you haven’t seen it you can’t imagine it…do click on the link above to get an idea. There was the year when there was a bit of a stoush somewhere on field and the Police let off tear gas and the crowd stampeded, knocking down the fence. Or the year when the mud at the Show came up to your ankles. Shoes were useless and you just had to hope you didn’t catch anything infectious. Where else would you forever wonder if your beautiful cat had wound up in someone’s cooking pot or as a new hat. 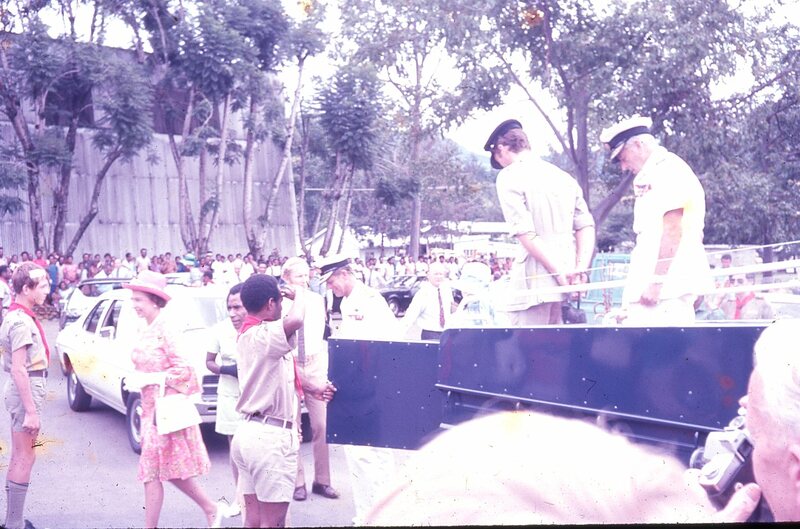 In early 1974, Queen Elizabeth II came to visit Goroka, along with Prince Philip and Princess Anne and Capt Phillips and Lord Mountbatten. Nowhere else in the world would you be likely to get so close to royalty, even in those days. 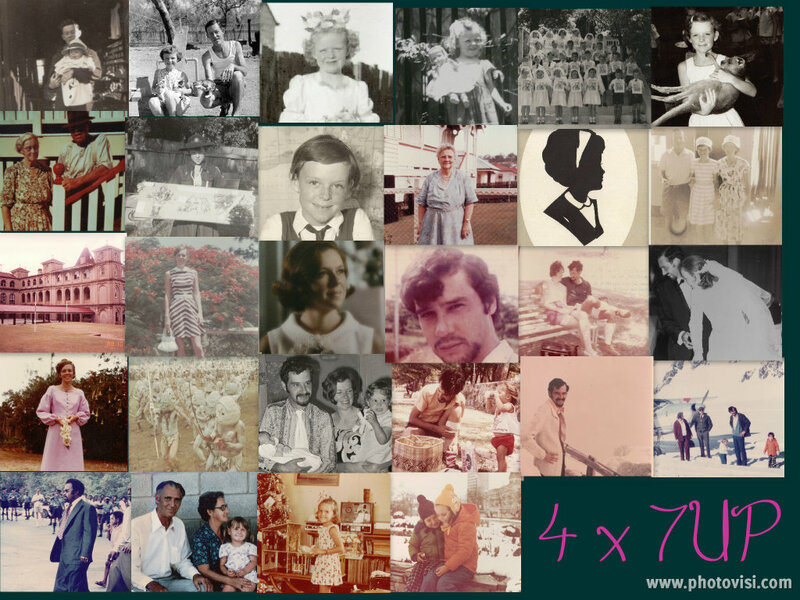 As I clicked and clicked, from one location to another, I swear Philip looked at me as if to say “not you again”. 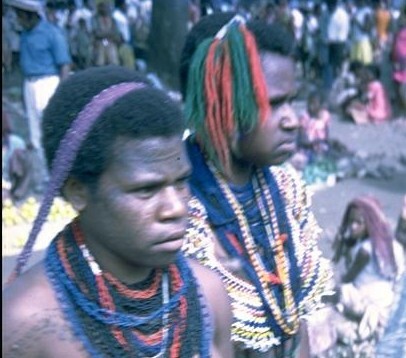 PNG gained self-government in September 1974, and we were a little fearful given how bloody this event had been in many African nations in the preceding decade. Our fears were unfounded and all we heard were some rubbish-bin-lid banging (something of a local tradition) and yelling. This was great because when Independence came along a few years later we were able to fully enjoy it. I wonder just how many Aussies can trace their Scottish roots back to Glasgow, however briefly. My guess would be an enormous number because Glasgow was the transit point for those displaced from the Highlands and country areas, the source of work in the increasingly industrial age, and a point of departure by bus, train or ship. My McCorkindale family are no different. Duncan McCorkindale left his birthplace at Cairndow on Loch Fyne, to head to Glasgow some time between 1851 (aged 9) and 1861 (aged 19). 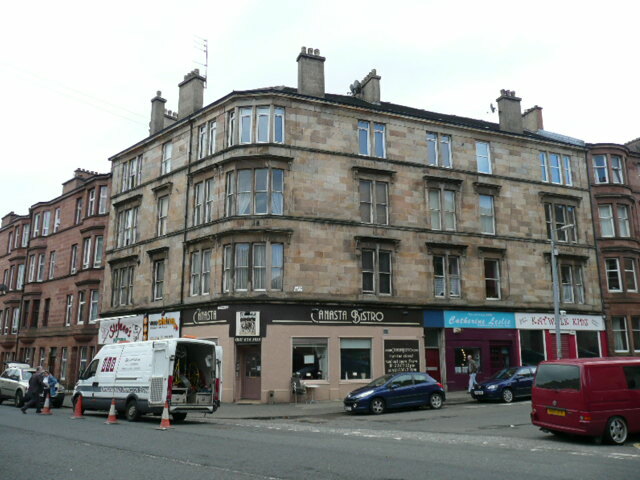 On the latter census Duncan is living in Central Glasgow (probably Albert St) and is a lodger with the family of Thomas and Elizabeth Logie (also from Argyll). He is listed as a joiner, as is Thomas Logie, which suggests to me that Duncan has already completed his apprenticeship, or perhaps was training with Thomas. In 1864 when he married his first wife, Annie Tweedie Law, he states his occupation as journeyman joiner. Over the years the family moved from pillar to post around Glasgow. It’s hard to know why this was so, perhaps just because of a growing family, perhaps to get work. Duncan died in 1906 and in 1910, his widow and their children, one of whom was my grandmother, Catherine (whom I wrote about recently here), emigrated to Australia presumably for a better life and to rejoin their eldest sons who’d emigrated in 1900. An overview of the Glasgow Heritage displays in the Council Chambers. © P Cass 2010. Until recently we’d never really spent time in Glasgow, rather using it as a transit point like so many of the emigrants. In 2010 we flew into Glasgow and prioritised having a look around. We did the tourist thing and checked out various tourist sights and took the city bus tour. By sheer coincidence there was a Glasgow heritage event, which was really interesting. 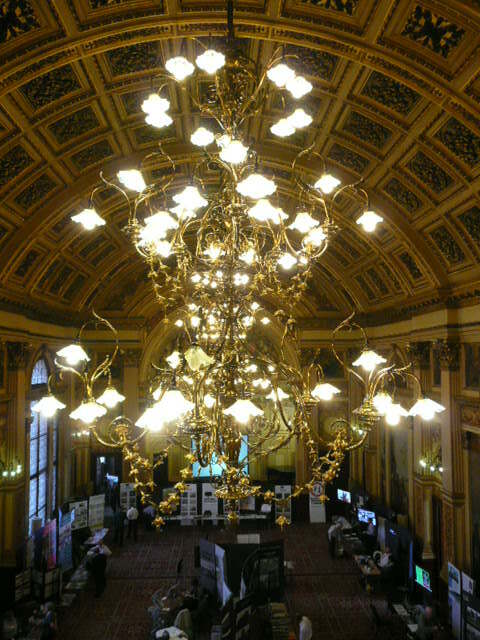 This event was held in the Glasgow City Chambers and if you’re ever in Glasgow I can highly recommend taking their free tour just to see the fabulous architectural features. 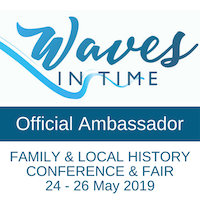 I’d also wanted to refer to some shipping business records in the University of Glasgow Archives tucked away in a funny little building, and fit in a visit to the Glasgow and West of Scotland Family History Society who were very helpful. Of course we also did the drive-around checking out the family’s addresses, learned from certificates and censuses. Many of the buildings were no longer standing, demolished and replaced by new businesses, but we did manage to find two of their homes. As always, never enough time, including the opportunity to visit the Mitchell Library, and I wish for a longer visit in the future when we can hopefully afford to stay in the same fabulous B&B…the perfect antidote to jetlag…thank heavens for a strong Aussie dollar. St Michael's Catholic Church, Gorey, Co Wexford where my Sherry family were married and baptised. © P Cass 1992. Gorey in County Wexford has lots of significance in my McSherry family who lived there for over 15 years. My great-grandparents Peter McSherry and Mary Callaghan were married there and their first two children were born there. It was from here that the family would leave for Australia in 1883, a year after Peter’s parents and siblings had also emigrated. James and Bridget McSharry (then Sherry) lived in the townland of Knockina. I’ve recently told the story of Bridget’s life here. 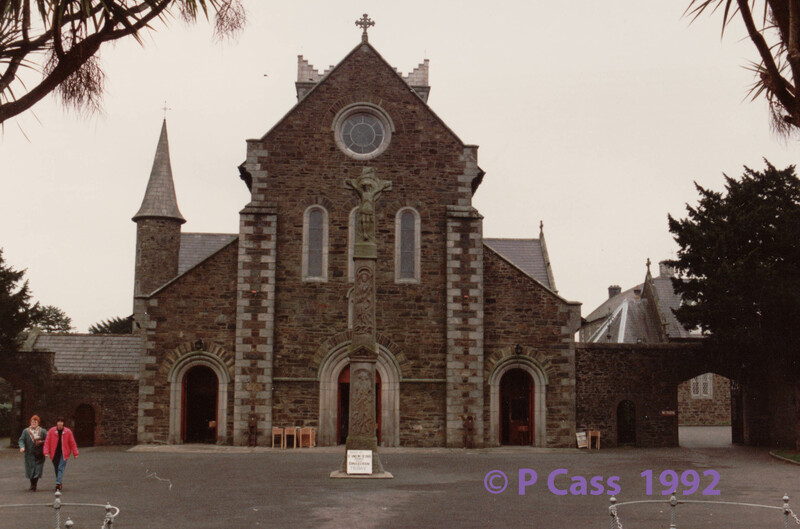 When I visited Gorey in the late 1980s, St Michael’s Catholic Church, was of course a focus. The priest was amazingly kind, and let us peruse the church registers to find the various family events. I wonder if there were any I missed due to lack of experience? Gorey also has a high profile in Irish history being involved in the 1798 uprisings. I’ve not researched this in detail so will leave that to anyone with a specific interest. 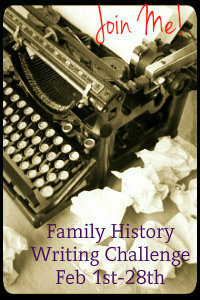 Rebelhand’s blog talks about the 1798 Wexford and family history. Julie at Anglers Rest who tempted me onto the A to Z path and is posting about her experiences in Australia and her Aussie genealogical connections. 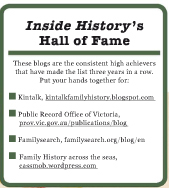 Susan on Family History Fun whose posts I thoroughly enjoy each and every time. Ros at GenWestUK came recommended by Susan and I’m enjoying learning completely new things…who knew Englishry was a word, I didn’t. Holly Michael’s Writing Straight. 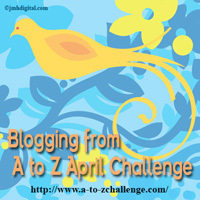 Holly commented on my blog posts and I enjoyed looking at her posts. 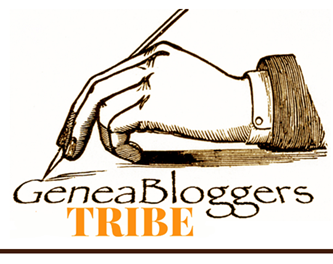 I especially liked that she is “nodding” to other blogs and has inspired me to try this too. Seams Inspired is writing about sewing terms: lots of memories for me on this one.